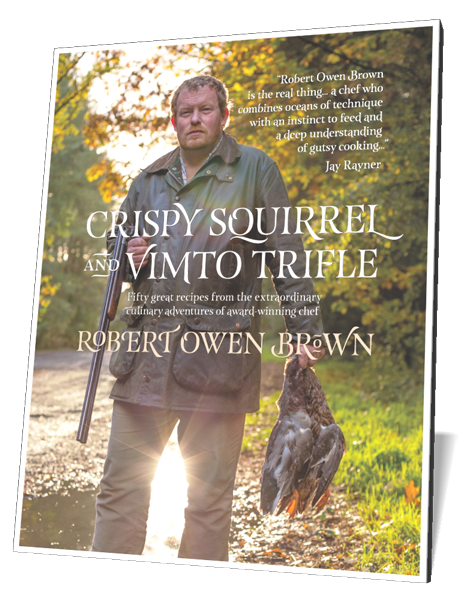 Crispy Squirrel and Vimto Trifle is a celebration of Robert Owen Brown’s genius as a chef, and an exploration of how his North Western roots have been central to how he thinks about – and cooks – food. Admired by food critics such as Jay Rayner and respected by fellow chefs such as Fergus Henderson, Robert Owen Brown is not only a chef who knows all the correct preparations of tripe and how to present the perfect grouse, but a man of great finesse who can charm with subtle details in starters and puddings. Currently Executive Head Chef at The Mark Addy in on the banks of the River Irwell, he’s previously worked in some of Manchester’s best-loved dining establishments, including The French at the Midland, Reform, Lounge Ten, The Bridge and The Angel. The book contains fifty deliciously distinctive recipes, combined with anecdotes and insights into the colourful life and experiences of the chef himself. Co-written by Neil Sowerby, and sumptuously photographed and designed by Joby Catto, this is both a practical, yet beautiful and informative book. Combining autobiographical laughter and lip-smacking dishes, Crispy Squirrel and Vimto Trifle is the perfect gift for the food lover in your life.